La Colonia de Eden Gardens — simply known as La Colonia to locals — is less than one mile from the beach, within walking distance of shops and restaurants, and home to some of the most popular, authentic Mexican eateries in the area. As part of the larger Solana Beach west of I-5 community, La Colonia reflects the small-town charm found on this side of the interstate. Some of the original buildings and adobe homes can still be found among the newer construction, and descendants of the first families that established this community in the 1920s still call this neighborhood home. La Colonia de Eden Gardens was first established around 1920 and is one of the oldest communities in Solana Beach. Originally developed to house the families of Mexican workers working on ranches and in fields in Rancho Santa Fe, Del Mar and Carlsbad, the community grew as more immigrants found their way to La Colonia. It did not become known as Eden Gardens until a land developer thought that moniker might be more appealing and registered the name in 1923. In the 1940s, it became known as La Colonia again, and now it is largely known as La Colonia de Eden Gardens — although most locals simply call it La Colonia. Many of the original families that lived in La Colonia in the early days still call this small community home. More information about the history of Solana Beach, in general, can be found at the Solana Beach Heritage Museum in La Colonia County Park or on the City of Solana Beach website. La Colonia was once home to single-level adobe residences built by the families who first came to this area. Many of these homes have since been razed as owners passed or moved away and replaced by two-story homes, condominiums and apartment complexes. This has provided more modern housing options and allowed for population growth, but some believe it has also taken away some of the community’s original charm. Because this is a small community where many descendants of the original families still live, it can be challenging to find a variety of homes on the market at one time. The only home I can find on the market at the time of this writing is a short sale for a four bedroom, two bathroom, 1,999-square-foot home listed at $699,000. This home looks to be already in escrow, which shows just how challenging it may be for hopeful home buyers to find a home in Eden Gardens. Anyone interested in visiting or relocating to La Colonia simply must make a point to stop at some of the local hotspots that have been serving the community since its earliest days. This includes Don Chuy, Tony’s Jacal and Fidel’s Little Mexico, each of which serves up some of the most authentic, delish Mexican food you can find in Solana Beach. Don Chuy first opened as La Tiendita in 1932 and was one of just two stores in the neighborhood at the time. It was established by Jose and Elvira Granados and evolved over the years to become Don Chuy, which is still run by members of the Granados family. Tony’s Jacal was opened by Tony and Catalina Gonzales in 1946, and there are now three generations of the Gonzales family serving their customers. Fidel’s Little Mexico got its start in the 1960s when Fidel Montanez started serving tacos in his barber shop, but it has now grown so much that he transformed what used to be his two-story home into a three-level community gathering place with multiple patios, bars, a happy hour and a gift shop. Residents living in the northern section of La Colonia de Eden Gardens will likely find the Solana Beach Towne Centre to be the most convenient spot for everyday errands. With more than 50 stores and restaurants, folks should be able to find most of what they need here. Eateries in this shopping center include Panera Bread, Crazy Bowls & Wraps, Carl’s Jr., Which Wich Superior Sandwiches, Panda Express, Jamba Juice, Starbucks and Real Food & Spirits. Shopping and services include Sprouts Farmers Market, Dixieline, Marshall’s, CVS Pharmacy, Staples, BevMo!, Discount Tire Store, Aaron Brothers, Kahoots Pet Store, an eye doctor, a dentist, a tailor, dry cleaners, hair and nail salons, and a mail stop. Just east of Interstate 5, residents will find another large shopping center with more than 50 stores and restaurants. In the Lomas Santa Fe Plaza Shopping Center, you will find HomeGoods, We-R-Fabrics, Vons, PostalAnnex+, Starbucks, The Habit Burger Grill, Pizza Nova, Rancho Santa Fe Veterinary Hospital of Solana Beach, Los Primos Mexican Food, Big 5 Sporting Goods, 24 Hour Fitness, Gymboree, Einstein Bros Bagels, Union Bank, Mission Federal Credit Union, Jersey Mike’s Subs, Samurai Japanese and more. Folks living in the southern part of the neighborhood are more likely to find the Flower Hill Promenade, Del Mar Center and the surrounding shopping area more convenient for everyday errands. At Flower Hill Promenade, you will find Yogurtland, Whole Foods Market, Cucina, Nothing Bundt Cakes Del Mar, Sweetpea Children’s Shop, Three Dog Bakery, Sun Diego Boardshops, The Wine Connection, Sea and Smoke, Pink Soul and Adornments. Del Mar Center is home to Petco, Albertsons, Pier 1 Imports, Del Mar Swirls, McDonald’s, Chevron, RadioShack, The Coffee Bean & Tea Leaf, Tabu Sushi Bar & Grill, PostAnnex+, Dunn-Edwards Paints and more. In this area, you will also find Armstrong Garden Centers, Wells Fargo Bank, U.S. Bank, Chase Bank and California Bank & Trust. Folks living in the southern section of the neighborhood are also close to ampm, Fish Market Restaurant, The Curious Fork, Pamplemousse Grille, Red Tracton’s, Denny’s, Solana Beach Appliance Pros and Shell. Folks who don’t mind driving a few minutes outside of the neighborhood can discover all sorts of interesting finds, including plenty of local haunts like Belly Up Tavern, Pizza Port, Hide Away Cafe, Naked Cafe, Solana Beach Coffee Company and Culture Brewing Company. There are also several small shopping centers scattered throughout Solana Beach, the Cedros Avenue Design District with more than 80 shops, salons, galleries and restaurants, and the expanded dining and shopping options found in Del Mar, Carlsbad and Encinitas. La Colonia County Park is the primary community gathering space in the neighborhood and is located at 715 Valley Avenue. At the park, you will find a playground with a play structure, picnic tables, barbecue grills, grassy picnic and play areas, a sports field, a walking path, the La Colonia Community Center, La Casita de Gloria and the Stevens House. The community center offers educational programming for adults, community events, meeting space for community groups, youth and adult recreational activities, and facilities that can be rented for special events, meetings and conferences. The Stevens House is the oldest house in Solana Beach and is now home to the Solana Beach Heritage Museum. Admission to the museum is free, and the museum is generally open from 1:00 to 4:00pm on the first and third Saturdays of each month. La Casita de Gloria Teen Center and La Colonia Boys & Girls Club is adjacent to the community center and provides a positive gathering place for younger residents. The staff provides after school and summer programs, including mentoring programs, tutoring, college nights and activities, and currently serves more than 100 youth each week. 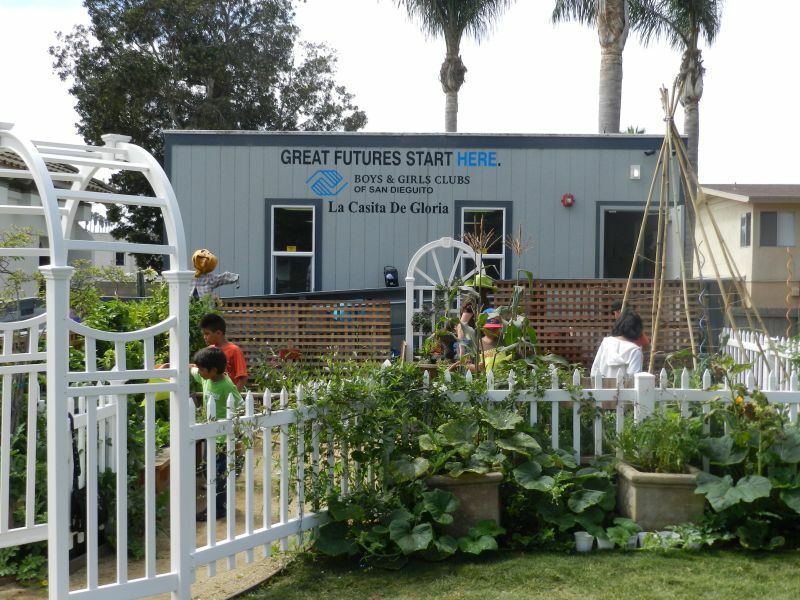 Youth can also learn how to grow organic fruits and vegetables and how to use them in healthy recipes in classes provided in the onsite El Jardin de los Ninos. There is also a community garden at St. Leo Mission Catholic Church that is managed by the La Colonia de Eden Gardens Foundation and provides gardening plots for local families who can sign up for a space in exchange for keeping it planted and volunteering to help maintain the garden overall. The coast is just minutes away, including Solana Beach’s four hotspots for spending a day enjoying the sun and the sand: Fletcher Cove Beach Park, Del Mar Shores, Tide Beach Park and North Seascape Surf Park. North Bluff Preserve and North Beach — which is Del Mar’s dog beach — are located just minutes to the south, and Cardiff State Beach and San Elijo State Beach are just a short drive to the north. Also to the north, you will find the San Elijo Lagoon, which is home to protected wetlands, seven miles of trails, and more than 700 species of plants and animals. Visitors can learn about the area and its flora and fauna through youth camps, self-guided walks and docent-led tours. The San Elijo Lagoon Nature Center is definitely worth a stop, and if you are bringing along your four-legged pal, you might want to check out the three-mile, dog-friendly, San Elijo Lagoon Trail. To the east of Interstate 5, there are expanded recreational options, including the public Lomas Santa Fe Executive Golf Course, the private Lomas Santa Fe Country Club, San Dieguito County Park and the La Orilla Trailhead. Heading east on Via De La Valle will deliver you to the Del Mar Horse Park in the North City neighborhood, which is a 65-acre facility with boarding stables, horse trainers, a dressage ring, two grass jumping stadiums, four practice arenas and four show arenas. Public school students living in the La Colonia area served by the Solana Beach School District for elementary school and middle school and by the San Dieguito Union High School District for high school. Generally, students in this area attend Skyline Elementary School, Earl Warren Middle School and Torrey Pines High School. Private schools in and adjacent to the community include Keystone Academy on Genevieve Street, Solana Beach Community Preschool on Stevens Avenue and Santa Fe Christian School on Academy Drive. Other Solana Beach private schools include Fusion Academy Solana Beach, Santa Fe Montessori School, St. James Academy and the Hanna Fenichel Center. Additional private schools, such as Cathedral Catholic High School, Cal Coast Academy, San Diego Jewish Academy, Good Shepherd Catholic School, Notre Dame Academy, The Winston School, Horizon Prep, Del Mar Pines School and La Jolla Country Day School, are located in the surrounding communities. Nearby martial arts studios, dance studios, equestrian centers and art studios offer lots of options for extracurricular activities. La Colonia de Eden Gardens is located within the larger Solana Beach west of I-5 community. It is north of Via De La Valle, west of Stevens Avenue, south of Academy Drive and Ida Avenue, and west of Interstate 5. The City of Del Mar and the Del Mar Racetrack are just to the south. Folks who are considering making La Colonia their home can find some great information about the area by visiting the websites of the Solana Beach Chamber of Commerce, the Solana Beach Civic and Historical Society and the City of Solana Beach. Those interested in getting involved in their local community should start by visiting the website for La Colonia de Eden Gardens Foundation. Photo Attributions (in order of appearance): Solana Beach Chamber of Commerce, Boys & Girls Club of San Dieguito, Solana Beach Chamber of Commerce Real estate data gathered from Zillow.com and Point2Homes.com.